Things are weird in the land of two-seater convertibles these days! We’ve Mazdas running around dressed up as Fiats, Japanese cars with turbocharged Italian engines, black is white, up is down, human sacrifice, dogs and cats living together... mass hysteria! It makes me long for a simpler time. As the resident sports car purist at Jalopnik, I welcome more roadsters. Thank god for the used car market. There are tons of old roadsters we can still buy today, as long as we’re willing to give them a little TLC. Roadsters from Fiat, MG, Triumph, Alfa Romeo, even Nissan and Mercedes... but which one do you buy? 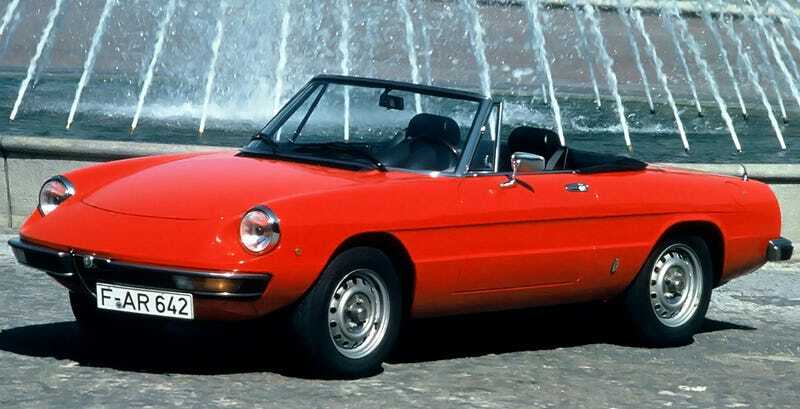 The original 124 Spider was like an Alfa Spider that someone made less... Alfa. Fast Alfas always want to get in your pants. Fast Fiats want to go barhopping and then crash on your couch at three in the morning with a half-eaten slice of pizza on their chest. The original 124 Spider was generally slower and less emotionally involving than an Alfa Spider, but it also cost less. (This, for the record, is generally the difference between any post-World-War-II Alfa Romeo and the equivalent Fiat.) It was a charming car, in its own right, but then, I’m biased—I used to be an Alfa mechanic. Which is great, but I still wouldn’t kick a vintage 124 Spider out of my garage. At least not at first. So of all the classic two-seat sports cars out there, which one would you go with? I suppose the original NA Mazda Miata is now old enough to be a classic, but why not go with something more... interesting? And expensive to repair. That’s all part of the fun.